When a person blows into a breathalyzer device, the air they exhale enters a chamber containing two glass vials. One is a mixture of aqueous sulfuric acid, silver nitrate (a catalyst), and potassium dichromate. The air is bubbled through this mixture and the sulfuric acid and potassium dichromate react with the alcohol, producing chromium sulfate and other products. The chromium ion of chromium sulfate is green in the solution, whereas the initially present dichromate ion was red/orange in color. The second vial contains the same reactants but doesn’t interact with the air sample, thus serving as a standard for comparison. The color change in the sample exposed to the air is monitored by a photocell (light sensor) system that is then used to determine the alcohol content of the air sample. 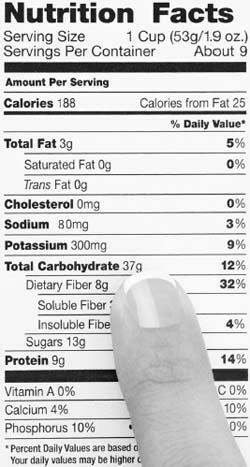 Calories in a serving of food can be calculated by the amount of protein, fat, and carbohydrates in the food item.